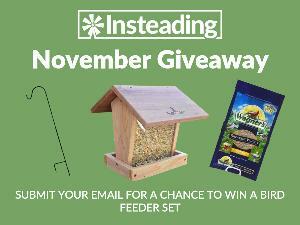 Prize: Bird Feeder Set including: Handmade Cedar Bird Feeder; 16-Pound Bag Of Bird Seed; Bird Feeder Hook Pole. What you must do to enter: complete form - for contest winners located outside of the US and Canada, sponsor cover up to $20 in shipping costs above and beyond the prize costs. Statistics: This contest was opened by 113 and entered by 4 ContestChest.com members. 4% of those who opened the contest, entered it.